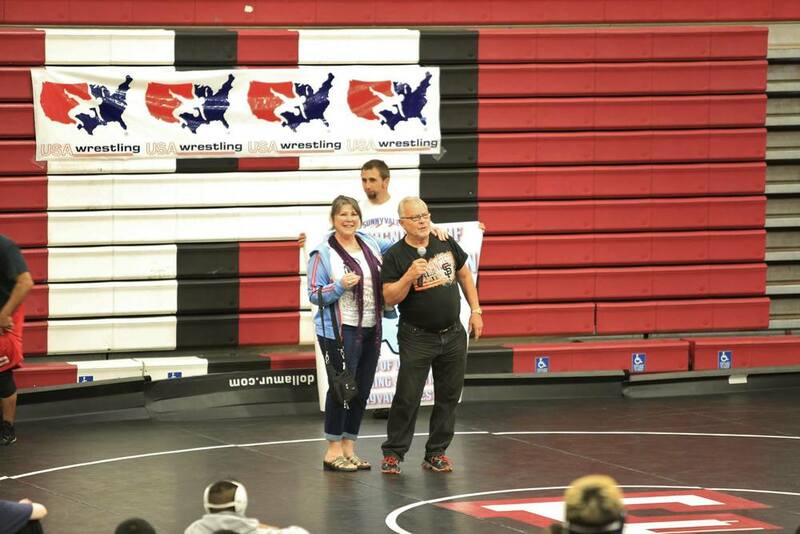 Coach McKeown, his wife Jo, and Coach McCune at the SHS Jet Memorial Tournament at Fremont High School 5/2/15. Coach McKeown was honored for his many years of dedication to Sunnyvale Wrestling. 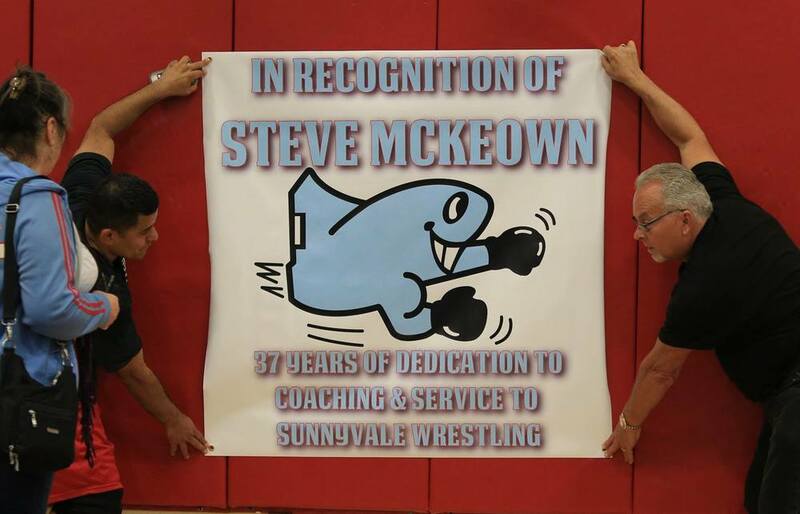 This year at the SHS Jet Memorial we honored long time coach and stud Sunnyvale High School Wrestler Steve McKeown. This was the first annual SHS Jet Memorial and we couldn't think of any more deserving of the being recognized than Coach McKeown. This event is run by the Santa Clara Valley Wrestling Association, which is our local CA USA Wrestling Association and we would like to thank Roberto and Laurie Dixon, as well as Kenn Amezcua for putting on such a great event in Sunnyvale. Jo McKeown, Coach McKeown's wife, wore Coach McKeown's old SHS warm up at the event Saturday May 2, 2015. Coach McKeown was a Northern California Invitation Finalist while wrestling at Sunnyvale High School and went on to coach the team and teach at Sunnyvale High. At the time Coach McKeown took over at SHS the team was coming off an 0-10 season, but under his tutelage they became league champions in 1979. 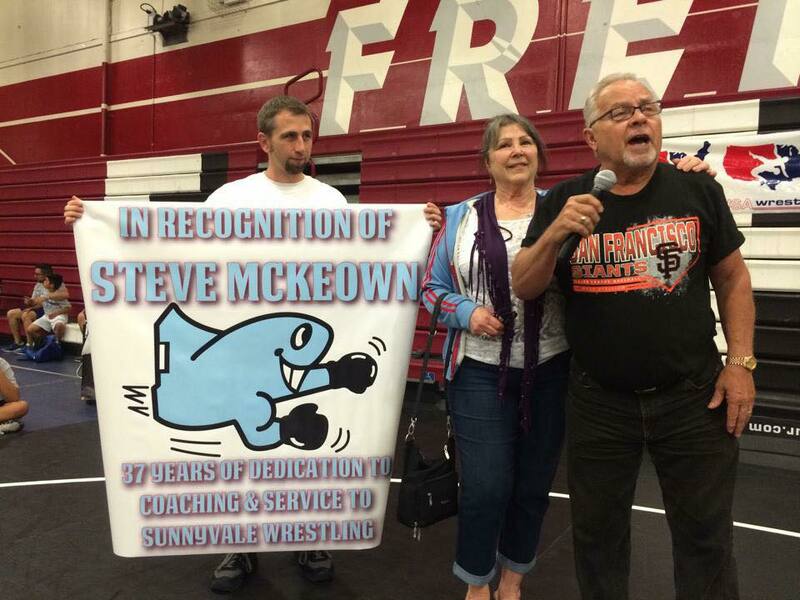 After the closure of Sunnyvale High School Coach McKeown went on to coach Sunnyvale Middle School and assist one of his wrestlers, Vince Baza, at Fremont High School. Sunnyvale Middle School also became a championship team under Coach McKeown. Unfortunately Vince wasn't able to make the event Saturday but he wrote a letter to Coach McKeown that contains a great deal of Sunnyvale High School Wrestling History. We have published the letter below. Sunnyvale High School Wrestling - De Anza League Champions in 1979 under Coach Steve McKeown. Notice long time Fremont Coach Vince Baza in the bottom left hand corner. I was coached by Coach Steve McKeown from 1975-1979. I was also Fremont High School's coach for 18 years. I still remember when I was in elementary and junior high school watching the Sunnyvale High School Jets wrestling teams. I had older brothers on the team who took me to some meets, tournaments and even practices. Of course, I had some favorite wrestlers growing up... Bud Kuntz, Ron Hill, Art Rivera, etc. etc. I would watch SHS compete against the best in the DAL (De Anza Athletic League). Even though Sunnyvale had a rich tradition, league championship teams always alluded them. Mainly because of powerhouses in the league such as Lynbrook High coached by Gus Talbot, who was Steve's high school coach at Sunnyvale High. There was the very powerful Fremont High coached by the Hall of Famer, Web Lawson. Saratoga, Los Gatos, Homestead, Cupertino and others with rich traditions in wrestling were also in the league . In a lot of ways, the competition back then was tougher to win a league championship because there were no "weak" teams in the league and every team had full Varsity, JVs and Freshmen teams. It wasn't just my brothers that inspired me to wrestle. It was the success, fun and tradition of "being" a wrestler for Sunnyvale High. The thing I always remember about Steve in his early years of coaching was he was obsessed to create a winning atmosphere. He immediately ingrained in the program that winning the League Finals was the goal. Since SHS never won the championships before, it was a lofty goal. I knew this before I became a freshman in high school. When I was a Freshman, I had two older brothers Ed and Dave already on the team. Steve had also coached another older brother John who was 3rd in the CCS and qualified for State. My brother Ed who also was 3rd in the CCS and a state qualifier for Steve went on to become a 2 time All-American at San Jose State University and was inducted into the SJSU Hall of Fame. In 1979, my senior year in High School, Steve guided SHS's FIRST and only League Championship Team. Such stars as Ed Crane (father to Greg Crane) and Brian Canali were on that team. Steve's legacy didn't end there. After SHS closed its campus in 1980, Steve spent many years teaching and coaching at Sunnyvale Middle School and assisted me coaching at Fremont High School. I can honestly say that had it not been for Steve helping me those early years of coaching, Fremont would have never flourished as it does today. Most of our successful wrestlers came directly out of Steve's middle school program. I always knew that anyone who wrestled for Steve would have a great foundation for any level of wrestling. Out of the years that Steve and I worked together, there were many State Placers that came from Steve's mentorship. Bobby Soto, Marcial Cruz, Oliver Salud and Warren Newsome to name a few. Even when they were not placing in State, they were contributing to the winning teams at Fremont High. Steve's wrestling tree also spread into Homestead High and Saint Francis High wrestling programs. The bottom line is, Steve is a winner! As a wrestler and a coach, Steve expected dedication, loyalty, hard work, love of the sport and toughness. Fortunately, we ALL owe Steve for instilling those qualities in ourselves. I want to tell you more about the success that Steve has done for the programs that he has helped, but we would be here for hours. I also have many "wild stories" to tell ... on another day. I'm happy that Coach Daniel McCune has organized this long overdue dedication to you Steve and the Sunnyvale High School programs of the past. I owe my coaching career to my coach.... Steve McKeown and anyone who ever wrestled for me, definitely received Steve McKeown teaching through osmosis. The wrestling tree that you created still runs through the hearts and blood of the Fremont wrestlers of today. I am sorry I couldn't make this special tribute to you and the SHS teams of the past. I am visiting my daughter in Portland, OR for her college graduation. Well done Coach and Congrats!